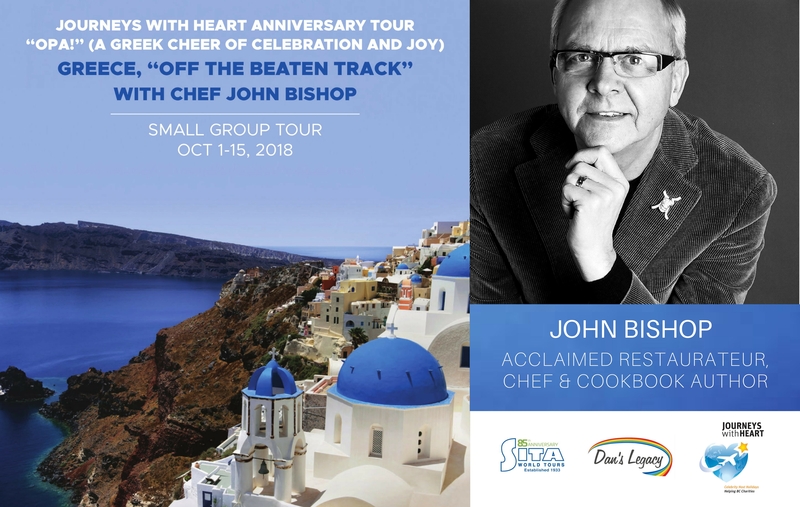 Journeys with Heart, a volunteer-based travel organization, is pleased to announce that well-known Vancouver restaurateur and philanthropist Chef John Bishop will guest host its fundraising culinary tour of Greece October 1-15, 2018. Funds raised by the trip benefit Dan’s Legacy. The 15-day tour, led by Chef Bishop, includes visits to famous historical and cultural landmarks in Athens, the islands of Naxos, Santorini and Corfu, and other locales in northern Greece. Hands-on cooking experiences and special trips to charming off-the-beaten track locales known only to locals make this an unforgettable journey. Since 2008, Journeys with Heart, has provided bespoke international tours for small groups of adventurers. Accompanied by guest hosts, including celebrities Pamela Martin, Christopher Gaze and Vicki Gabereau, the customized travel packages are designed to include traditional sights mixed with “hands-on” experiences. Each tour is paired with a local charity that benefits from the trip. “Over the past nine years we have grown slowly but steadily through the hard work, dedication and generosity of all involved,” says Jenny Karmali, founder of Journeys with Heart. “‘Travel with Purpose’ is a motto that continues to motivate and inspire us to create tours that are extraordinary and make a small difference in the lives of others.” Guests of the Greece tour will provide a donation to Dan’s Legacy in support of its counselling programs for at-risk youth. The tour is limited to a maximum of 24 guests and has just been released to sell! For more information, including the tour itinerary, package pricing and early booking incentives, please visit www.journeyswithheart or contact Jenny Karmali at jenny@trvlconcepts.com or 778-945-9007.